This is the final post in a series about Crossrail 2. The last post identified four small change to the proposed scheme. This post has my full alternative proposal to address the flaws previously identified. This proposal is a direct alternative to the TfL Crossrail 2 regional option. It comes in two parts, SwiftLink and PalaceLink, together known as the "Wink" option for Crossrail 2. (The "wink" name comes from the two lines together having roughly the shape of an eye in central London). The TfL Regional option is costed at £12bn. Through careful routing and planning, the combined SwiftLink and PalaceLink is costed at just £12.9bn. In other words for just £900m more, London can have two new lines, not one. To emphasise one key point - the concept is to build both new lines, not just to build one. The costings assume shared project management and construction. Map of the proposal. Click to view in Google Maps. The SwiftLink proposal is focussed on South West London. It provides a direct service from Clapham Junction and beyond to the City and Canary Wharf where the majority of South West Londoners work. This direct link greatly enhances the benefits of Crossrail 2 to South West London. As indicated above, the SwiftLink scheme can adapt to the choices made South West of Victoria - Chelsea vs Battersea Power station, and Tooting vs Earlsfield. It retains the primary route through the West End from Victoria to Angel, simplifying comparisons. The Green Park proposal is compatible and beneficial to both schemes at extra cost, so not discussed in detail here. Thus, the main difference is East of Angel. By turning East at Angel, the route provides a direct connection to the Northern City (where there is significant growth due to Tech City). It provides a connection to Crossrail 1, which would ideally be cross-platform. It then takes over the route to Canary Wharf entirely - Crossrail 1 services from Abbey Wood would run to Wimbledon instead of Paddington. * Note that Wimbledon is used as the base location, but journey time savings apply over the entire suburban route network via Wimbledon. The estimated cost of SwiftLink is £7.2bn. The following cost breakdown follows the same methodology used to evaluate the cost breakdown for TfL's £12bn scheme. These costs assume a tunnel portal at Battersea Power station. A portal at Earlsfield to serve either Chelsea or Battersea is about £600m more expensive at £7.8bn. Overall, the SwiftLink scheme is simple. It takes passengers from South West London directly to their jobs in the City and Canary Wharf, something which TfL's proposed scheme fails to do. By re-using the Canary Wharf branch of Crossrail 1, better service can be provided to both Stratford and Canary Wharf, supporting regeneration in the East. The PalaceLink proposal is focussed on North London and is based on TfL's Metro scheme in the North. It provides a direct link from Alexandra Palace, Turnpike Lane and Seven Sisters to a wide selection of zone 1 stations. The terminus at Victoria also allows passengers from South and South West London to use the line to access more of zone 1 direct without changing. The PalaceLink part of the proposal is based on Metro technology, with up to 40tph. This is a better technology fit for the North, where distances are shorter, and high frequency matters. It is important to note that Metro technology is not better or worse than Crossrail technology, just different. For example, a Metro train can accelerate and decelerate faster than a Crossrail train, resulting in a faster journey time, or more stops. There are many possible routes in the North, which all have relatively similar costs. Ultimately, the PalaceLink proposal uses this route to make comparisons with TfL's Metro option simple. Hackney is not served, as per the TfL Metro option, but could be at extra cost. The estimated cost of PalaceLink is £5.7bn. The following cost breakdown follows the same methodology used to evaluate the cost breakdown for TfL's £9.4bn Metro scheme. Note that some items have lower cost estimates because of shared costs with SwiftLink. Notably this includes Victoria and Old Street station, and a minor reduction in tunnelling costs. In addition, cost at Charing Cross is reduced by reusing the access passageways to the old Jubilee line platforms (although still requiring work to enlarge the platforms themselves). Overall, the PalaceLink scheme is a simple Metro in the tradition of London's existing tube lines. It deals effectively with the capacity issue of the North while offering a much wider range of destination choices in zone 1. The major job markets of Victoria, the West End, Mid Town and the northern City are all served, with an easy change at Old Street for Canary Wharf. It also provides additional, much needed, distribution from Charing Cross and Victoria termini, linking in well with SwiftLink to provide even more choice to South West London. Its not often that a transport proposal comes along which offers a supermarket style "two for one" offer. Yet that is almost what the Crossrail 2 "Wink" option provides, at a cost of £12.9bn, vs TfL's £12bn. Swiftlink serves South West London far better than TfL's plans, by taking passengers to the destinations they desire in the City and Canary Wharf, and linking with PalaceLink to serve Covent Garden and Mid Town. PalaceLink serves North London better as well, using the more appropriate Metro technology to provide a high frequency service to greatly relieve the Piccadilly and Victoria lines, without simply duplicating the existing route via Kings Cross. However, one of the main rationales for Crossrail 2's regional option (the only option they'd actually go for in my opinion) is to help deliver regeneration in the Lee Valley from Tottenham north through Enfield into Broxbourne. Design that in too and you might be onto a winner! A branch to Tottenham Hale from South of Seven Sisters with no additional underground stations would have an additional cost of around £0.9bn assuming it continued above ground to Cheshunt. There is no technical reason not to do it that I can see, so it just comes down to cost. Look at one of the previous articles SSW will the express tunnel from Esher to just east of Clapham Junction have to be constructed in order to release the capacity to support this version of Crossrail 2? Its seems that TfL are not willing to finance schemes of benefit to those outside the GLA boundary (a rather narrow view of London IMO). This means that any solution to the long-distance problems of the SWML need to be Network Rail/Government led. As such, it is easiest to say that the express tunnel is directly comparable to the Network Rail 5th track option. The effect of this is that Network Rail's 5th track would need to run from Surbiton to Clapham Junction. If neither the 5th track nor the SSW express tunnel is built, then all current slow line services would need to be part of SwiftLink. Whist the funding pot between a SWML Express tunnel / Network Rail and Crossrail Swiftlink / TfL would be different, it could in a respect it would offer an opportunity. It would be interesting from a (construction) programing perspective / maintaining the experience gained with constructing Crossrail, whether the chance to follow up with the proposed SW Express Tunnel, then a Swiftlink scheme would be the way ahead? From a TfL perspective it would offer a gap between Funding then 2nd Crossrail line without the cost of the experience being loss. I certainly think that a sensible Government/TfL planning process would take advantage of the phasing. The express tunnel is less than £2bn and ties in with planned work at Waterloo on the Eurostar platforms, so it makes sense. Opening that first would also provide more space for train plan adjustments, lowering the cost of CR2. However, I suspect that the time-line is too short to allow that to actually happen. This appeals to me strongly as it serves more of the key centres and would , especially combined with some other ideas, develop more of a crossrail 'network'. To what extent would this supercede the Swanlink idea? And do you think DfT would proceed with Swiftlink - as it serves Euston for HS2 - and leave the Palace link till later, even though that would cause the latter to be more expensive? 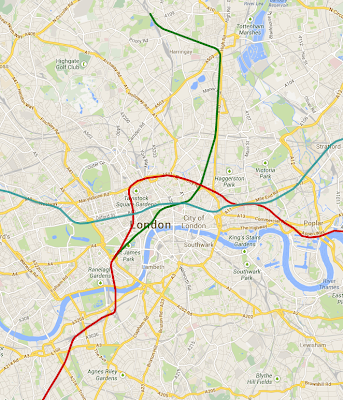 Swanlink remains the cheapest way to get a tunnel through central London. However, the downside is that it does not serve the West End which is a major goal for non-commuter traffic. Swanlink lives or dies based on the Waterloo tunnel portal. Assuming that remains feasible, then with SwiftLink linking to CR1 you need an alternate destination. The Great Northern & City route is the obvious option, with a new Moorgate pair of platforms. That said, it is more likely that the next line would be into South East London, perhaps a Bakerloo or Metropolitan line extension, or perhaps a CR3. On funding, my view is that two lines allows the funding to be more thinly spread, with "only" £8bn to find for HS2's opening date and the remainder afterwards. While the DfT could kill PalaceLink, I hope that funding will be more devolved to London by that point. What London wants to spend its money on is increasingly different to that of the rest of the UK outside the South-East. At a minimum, I'd expect TfL to do the work at Victoria and Old Street to enable PalaceLink's cheaper platforms. any thoughts on this proposal from a Roehampton residents group who are campaigning to get CR2 diverted to serve areas that have very poor / no hard public transport infrastructure? The N-S route they've chosen to Epsom mirrored my own thoughts about interrconncetion with the SW mainline. Looking at the TfL CR2 route scoring exercise, I was struck by just how biased it was in favour of congestion relief, especially tube congestion, at the expense of serving parts of London that have had any public tranport infrastructure. If an entirely new CR2 route from Roehampton via Kingston intersected the SWML at Surbiton or East of Berrylands, wouldn't that free up a lot of capacity for those further down the line at Wimbledon by allowing same platform interchange for Central London for SWML commuters? I can see a natural route south of Kingston via slightly east of Berrylands, south of the A3 to join to the existing Tolworth, Chessington line. This could then be extended to Leatherhead as per your previous proposals to provide limited relief to the Brighton mainline? As a Surbiton resident, the key deficiency of CR2 is the failure to deliver any sort of resilience once the sole existing line to Central London is blocked. The last 6 months or so have been horrendous on the SW trains line from Surbiton because of suicides and track failures. Each time, commuters form the wider area who use Surbiton as a hub can only get the tube as far as Wimbledon, and have to bus/taxi the rest, which is either very time consuming or very expensive. It is the lack of resilience, not just the lack of future capacity that mark Kingston borough's transport infrastructure as fragile and not up to the job. We need new train paths, preferably North South, that would have the additional benefit of linking Kingston town to it's North Surrey hinterland. Providing a link to transport starved Roehampton is a further bonus. At this particular point in time, we have several strategic plots that are lying empty in Kingston. The land alongside the Green Lane sewage works, the large failed Tesco development at the Tolworth/A3 junction, and Surbiton station car park. These can offer development opportunities to partially fund any new train path. A new line Chessington/Kingston/Roehampton would be a metro line with a number of stations. Such a line would be unable to take faster services which is where the real capacity crunch is (the slow lines can get by with longer trains). Your point on resilience is well made, but is a natural problem of most places outside zones 1 and 2. Kingston is actually fortunate as it has 2 routes to London, via Richmond and via Wimbledon. A non-stop tunnel Esher to Clapham would provide resilience, with an extra modern route and less pressure on the existing lines (thus more ability to recover from problems). Unfortunately, a N/S route through Kingston is unlikely as heavy rail simply because the costs would be too great for the benefits (using current analysis tools). A light rail option would be much more viable. Otherwise Crossrail 1 would lose the lucrative Canary Wharf to Heathrow direct connection. As for the palacelink.. have you considered an extension of the DLR from Bank ? A key rationale for Crossrail 1 is to relieve the Central line. The key to that is Stratford, where instead of people moving from the Shenfield line to the Central line, people will move from the Central line to Crossrail 2. That works best if Crossrail 2 continues to serve Farringdon, Bond Street and Paddington. The Abbey Wood branch is newer traffic and will probably be easier to alter. The Heathrow connection would be lost (although only to a cross-platform change) but a direct connection to Euston/St.Pancras would be gained (for Eurostar). In addition, South West London is one of the key areas where staff at Canary Wharf offices live, so making that connection direct is extremely valuable. While PalaceLink could technically extend the DLR, it would be even more investment favouring Canary Wharf and the City at the expense of the West End. TfL have indicated that options serving the West End tend to have a better BCR because they get traffic all day long, whereas the City and Wharf traffic is much more peak-focussed. I live in Basildon where it is proposed that 12600 new homes will be built, and there will be many in Thurrock and the E London boroughs. So this made me think of your proposal, is it realistic to extend one of the branches as far as the junction at Pitsea, perhaps along both the Tilbury loop and the main line via Basildon. Extending from Canary Wharf via Canning Town would require extra tunnelling so would perhaps be a longer term consideration when compared to services via Stratford. Both would be nice of course. In an ideal, money no object, world, it would make sense to build a link from east of Custom House (or east of Woolwich CR) to Dagenham Dock and then run services on to Pitsea. It would provide direct links to Canary Wharf which would be very valuable to that area. And with 30tph rather than 12tph on the Wharf branch it makes perfect sense to send some trains that way.